Standard cars come with a rubber / metal combination bush, which is the only option for a manufacturer and isolates noise well. However, when it comes to freedom of rotation, and accurate location of the wishbone ends under load, it leaves a lot to be desired. The Nitron wishbone bearing kit replaces all the inner rubber bushes with Teflon lined spherical bearings. These are typically frozen prior to installation, easily placed down the wishbone bush tubes, then either side of this bearing are spacers machined form 7075-T6 Hard Anodised aluminium. 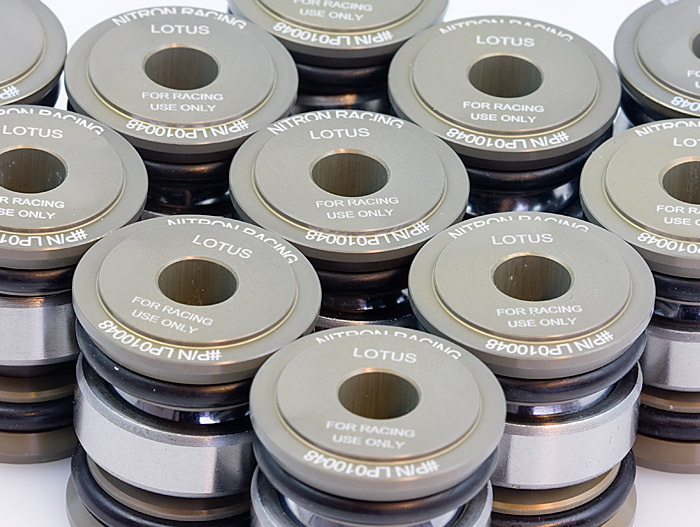 These spacers have an o-ring seal placed on them before being inserted into the bearing, with sufficient grease applied first. There is no need to tighten these in a particular position like rubber bushes, and as they are fully sealed they will not require any maintenance. The kit comprises 14 shorter bearing assemblies and 2 longer bearing assemblies for the front end of the rear lower wishbones. A combination of Moly Fortified and Sienne Grease is recommended for their installation. This kit has been tested in the Britcar 6 hour race this year and the wishbones felt tight at the beginning, then loosened up after the 9 hours of the event, which is perfect.